Book: Geiger, D.L. Oct. 30, 2012. 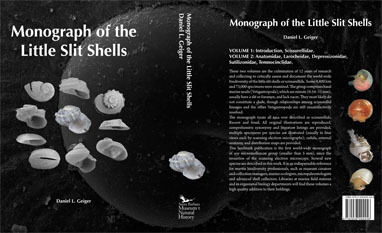 Monograph of the Little Slit-Shells. Volume 2: Anatomidae, Larocheidae, Depressizionidae, Sutilizonidae, Temnocinclidae. 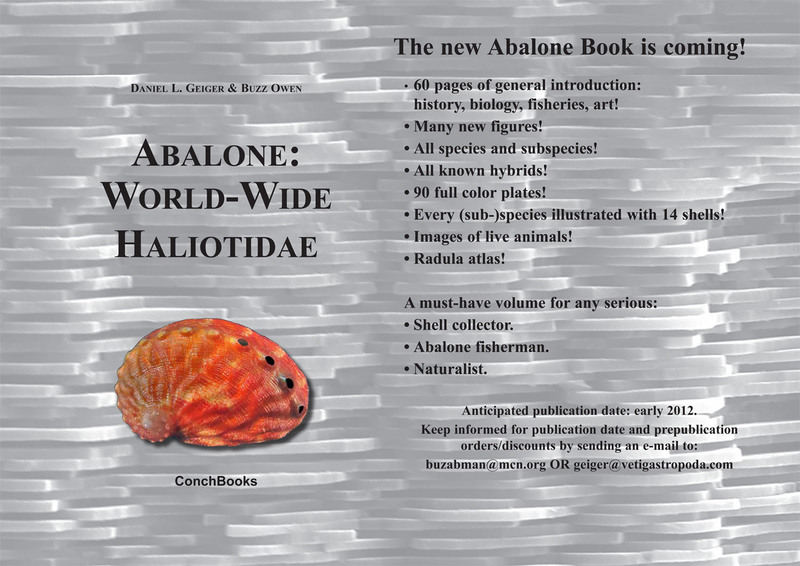 1291 pages, 1042 figures, 5 color plates, 11 identification cards, >900 references, 17 new species described. Book: Geiger, D.L & B. Owen (2012). 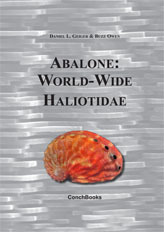 Abalone: World-Wide Haliotidae.viii + 361 pp. 91 color plates. Radula atlas, new subspecies described by Owen and Owen & Afonso. Symposium volume: Geiger, D. L. & B. Ruthensteiner (eds, July 25, 2008). Micromollusks: Methodological Challenges - Exciting Results. To purchase the volume, go to www.mapress.com/zoosymposia. 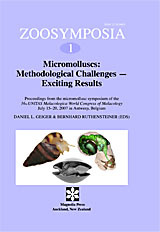 The present volume contains the proceedings from the symposium Micromolluscs: Methodological Challenges – Exciting Results held during the 16th UNITAS Malacologica World Congress of Malacology in Antwerp, Belgium, July 15–20, 2007. For the purpose of this volume, micromolluscs were defined as molluscs no larger than 5 mm. Such forms play an important role in a variety of research fields, such as origin, phylogeny or biodiversity of the phylum. It is widely recognized that the small molluscan fauna is incredibly diverse and replete with significant discoveries to be made, yet few people work on micromolluscs as they are perceived as being difficult to deal with. The world of micromolluscs is still wide open, as is shown here. The contributions cover a wide spectrum of scientific aspects ranging from methodological assessments, case studies, to review articles. We aim at encouraging working with micromolluscs and showcasing that the types of discoveries that can be made are well worth the slightly greater effort expended. Book: Geiger, D.L & G.T. Poppe. 2000. Haliotidae. in Conchological Iconography. G.T. Poppe & K. Groh (eds.). Conchbooks, Hackenheim. 135 pp., 83 pls. <conchbooks@net-art.de> or visit their website. The pdf-files provided here are large, which may take several hours to download. I have tried to use lower quality settings with only insignificantly smaller files, and much reduced reproduction quality. To reduce size somewhat, the files are only compatible with Acrobat 7 or higher. Running Optical Character Recognition on the files does reduce file size, though also produces a grainier result; please note that the OCR algorithm produce garbage words, hence the files are still not searchable. Links go to password protected directory to thwart bots. Username is my last name, password is the scientific name of the phylum this site is all about. If you have problems, send me an e-mail. An extremely rare catalog of shells including some descriptions of new taxa. Geiger (2003) discussed the work, and a website with interpretative translation is provided. Pdf made from cleaned-up microfilm available from UC Berkeley library. An uncommon work on invertebrates of the Red Sea including sea slugs and some bivalves. The entire text and plates 7-12 (1-6 not available) are provided. Pdf made from copy in the collection of the Santa Barbara Museum of Natural History. Schepman (1908) Siboga Expeditie, Volume 39, Part 1: Rhipidoglossa and Docoglossa. A classic expedition report with many new species described and radulae illustrated. Pdf made from copy in DLG personal library. von Martens (1903) Die beschalten Gastropoden der deutschen Tiefsee-Expedition 1898-1899: A. Systematisch-geographischer Teil. Deutsche Tiefsee-Expedition 7: 1-146, pls. 1-5. Thiele (1903) B. Anatomisch-systmatische Untersuchungen einiger Gasstropoden. Deutsche Tiefsee Expedition 7: 147-179, pls. 6-11. Ramirez-Böhme, J. (1981) Moluscos de Chile. 1 Arcaheogastropoda. 149 pp. From library of Gene Coan. An elusive work.